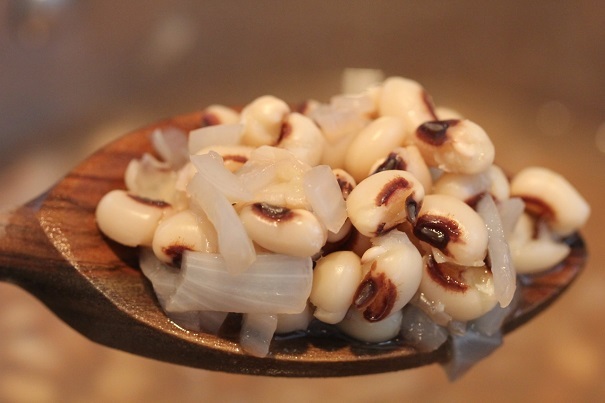 In a large pot combine the black-eyed peas, onion, salt and pepper. Add water, stir, and bring to a boil. Reduce heat to medium-low and cook bean mixture for 1 ½ hours, covered until black-eyed peas have softened. While beans are cooking, cook bacon on stovetop until crispy. When black-eyed peas are cooked, add bacon and stir in the rice. Cover and cook until rice is tender, about 20 to 25 minutes. Serve hot topped with chopped green onion.